One of Jesus’ best known and most spectacular miracles was the feeding of five thousand people with a few loaves and fishes. All four gospels have accounts of that miracle, but less well-known is the fact that two of these gospels, Matthew and Mark, record that Jesus also feeds four thousand people in similar fashion. These stories, whether or not they are based on real events, have more to say to us than the simple recounting of a miracle, as I eventually discovered. The main point of interest for me is that the accounts are peppered with numbers, which vary between each account in a manner that suggests they have a deeper message to convey. I struggled with these numbers on and off for two years, trying in vain to extract some esoteric message. However, I was looking for subtleties that just weren’t there. Also, at first I didn’t realise that the events of 9/11 were encoded throughout the Bible. But once I knew what I was looking for, it only took me a few minutes to correctly decode the numbers. Rather than give each gospel account in full, I will simply reproduce the verses that have the numbers. After that I will show how these numbers can be very simply combined to create totals with factors that point inexorably towards the Second Coming. There are no less than six versions of the story of the miracle of the loaves and fishes. What I am going to do now is extract the numbers found within each account to obtain six numerical subtotals. 34 “How many loaves do you have?” Jesus asked. “Seven”, they replied, and a few small fish”. 37 They all ate and were satisfied. Afterwards, the disciples picked up seven basketfuls of broken pieces that were left over. 38 The number of those who ate was four thousand, besides women and children. 6 ... When he had taken the seven loaves ad given thanks, he broke them and gave them to his disciples to set before the people, and they did so. 8 The people ate and were satisfied. Afterwards, the disciples picked up seven basketfuls of broken pieces that were left over. 16 Taking the five loaves and the two fish and looking up to heaven, he gave thanks and broke them. 10 ... There was plenty of grass in that place and the men sat down, about five thousand of them. A summary of the numerical subtotals for each of the six accounts, along with its biblical reference, is given in the table below. I have coloured the references to reflect a peculiarity in the distribution of these accounts. Both Matthew and Mark contain two accounts of the miracle, one each of Jesus feeding 5000 and 4000 people. On the other hand Luke and John only contain one account each of Jesus feeding 5000 people. These accounts are respectively coded brown and green. It turns out that if we sum these numbers in their biblical ordering (which is the order in which they are given here), then factorise the running total as we go along, we notice that a familiar factor appears, and in a way that harmonises with the peculiarity of the gospel accounts. From the table it can be seen that the multiples of 11 mark the colour-coded passages. 1. The total of the multiple accounts in Matthew and Mark, coded brown, is a multiple of 11. 2. The grand total is a multiple of 11. 3. Consequently, the single accounts in Luke and John, coded green, also sum to a multiple of 11 (10120, which is 11 x 920). The highest prime factor of the grand total of 28380 is 43. This is the reduced value of 'Jesus Christ'. 28380 also factorises into 55 x 516. These numbers proclaim the essential message of the code. It already looks as if the accounts have been deliberately engineered to encode these numbers. Could the original authors have been the engineers? The fact that these numbers only have meaning now, in a language that did not exist when the Greek-speaking authors wrote the gospels, goes a long way towards refuting any such idea. However, if we now look at the biblical locations of these stories we become certain that they could not have engineered this wonder. The next table lists the chapter number of the each account and the running totals of these numbers. I found the number 58 encoded within these parallel accounts in two more ways. 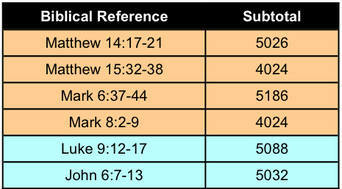 Firstly, I worked out each chapter's place value within the Bible then summed them as with the chapter numbers. Next, I summed the verses within each account that contained numbers. Thus the essential message of the New Bible Code, that 9/11 symbolised the Second Coming of Jesus Christ, is repeated here, encoded into the story of the loaves and the fishes. This was mainly through three numbers: 11 (9/11 and Jesus), 43 (Jesus Christ) and 58 (Second Coming). The encoding of the locations refutes any suggestion that the original authors encoded the numbers, because chapters were not added to the bible until the 13th Century and verses weren't added until the 16th Century. The linking of the stories of Jesus feeding the multitudes with 9/11 and the Second Coming is another extraordinary example of the way the New Bible Code uses biblical narratives to symbolise what was achieved on 9/11. Although utterly tragic in one sense, 9/11 must have been nourishing on a spiritual level, the effect undoubtedly amplified by the power of the media so that the entire world was ‘fed’ on what happened that day.